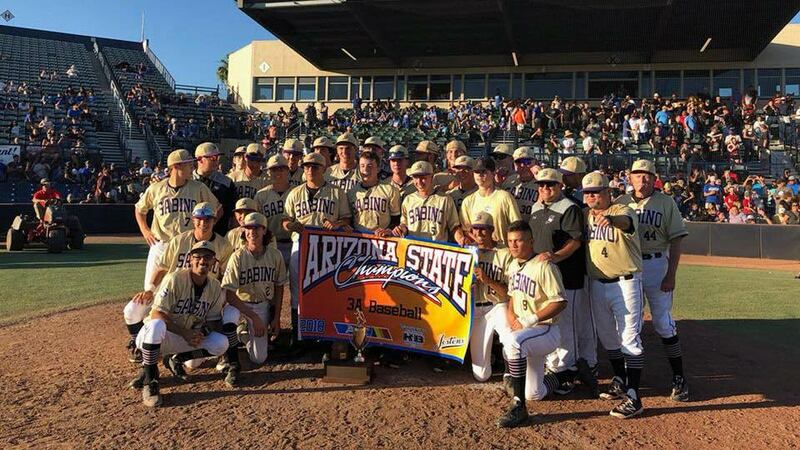 Sabino High School's 2018 Varsity Baseball team had a come from behind victory to become the 2018 3A Baseball State Champions. Sabino High School's baseball team will be able to compete in the upcoming season but will no longer be recognized as the 2018 3A state champions. The decision by the Arizona Interscholastic Association, which oversees high school athletics, is a response to an appeal by TUSD after the AIA decided to revoke the team's state title and place it on a year-long probation. The association overturned the decision to put the Sabercats on probation following an investigation over the summer. TUSD Superintendent Gabriel Trujillo and Sabino Principal Russell Doty failed to appeal the AIA's decision to revoke the team's 2018 title on Wednesday. "In this particular situation the AIA has decided to keep the title vacant," Trujillo said. TUSD's appeal centered on the idea that the district and the school took swift disciplinary action on all the coaches involved and put together a pretty comprehensive corrective action plan for the district and the athletic program, Trujillo said. "We fervently believe that the AIA have been excessively harsh with the consequences that it levied against Sabino high school," he said. Although disappointed, Trujillo said, he and principal Doty are happy knowing the baseball team can compete in the upcoming season and have another shot at the title.